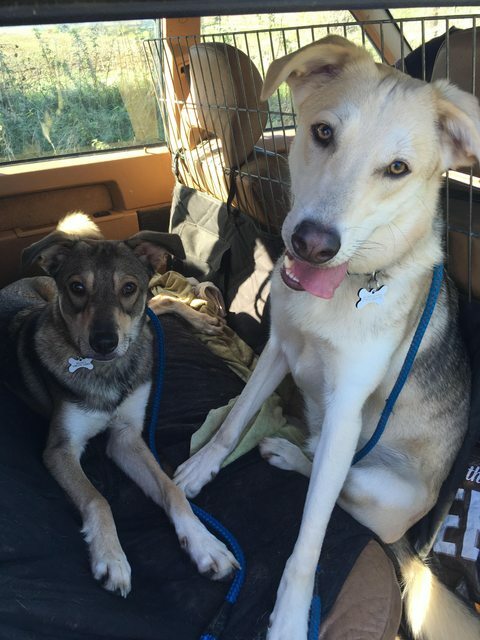 Storm, on the left , and his brother Blaze, on the right are 2 year old Husky cross from Romania. They are a very bonded pair so are looking for a home together. They are fantastic dogs, very lively and love nothing better than to play together and have a good wrestle, they would do this pretty much all day if they could! They are sociable with most dogs but can get a bit too much for small dogs because of their size. They haven’t been cats tested, but again because of their size and they are still like big silly puppies it’s probably best they don’t live with cats. They are fantastic out on a walk, but do not do too much street walking, they love to run off lead, so they need a country setting with fields on their doorstep or a short drive away, so they can let off steam and energy. They need someone at home with them for most of the day so they don’t get bored and into mischief. They need an experienced owner that has the time and commitment to socialise and train these boys further. For further details about adopting a dog from Hessa's Homeless Hounds, please email: hessariddett@aol.com or telephone: 07972 855779. Please note, all dogs rehomed via this rescue will be microchipped, vaccinated and neutered/spayed. Home checks apply pre-adoption and full post-adoption support is offered.